This salsa recipe is easy, tasteful and refreshing. It pairs well with all types of tacos, but especially with pork tacos and fresh tortilla chips. Whether served as a sauce or as a dip, this recipe incorporates the tropical flavors of pineapple and mango for a unique and bold taste that’s absolutely perfect for summer. All you really need is the ability to chop up some ingredients finely, and a way to store the salsa so that it stays fresh. We recommend mason jars, which can easily keep your salsa fresh for about a week after making it. Start by peeling and coring the pineapple before chopping it into very small pieces. Then, peel the mango and do the same thing. Chop up the two plum tomatoes, along with the red onion. If you’re not a big fan of strong onion taste, you can also substitute the red onion for something a little less strong in flavor, such as a sweet onion. Of course, if you like red onion, you might consider adding a little bit more than the standard quarter of a cup. Chop up your clove of garlic after peeling it from the skin (you can also use minced garlic, but fresh garlic does make a big difference in the overall flavor). Add all of these ingredients into a large bowl. Then, juice one full lime and add that into the mix, being careful not to get any seeds into the mixture. The lime juice will add a light citrus flavor while also helping the other flavors mix together. It’s also a good idea to add a pinch of salt to the salsa, which will also help draw out flavors from the various ingredients. Finally, chop up some fresh cilantro until you have three tablespoons full of the finely chopped herb before adding it to the bowl. Mix all the ingredients together until married well. Then, cover the bowl with a piece of plastic wrap and place it into the refrigerator to chill before serving. Waiting an hour will give the flavors time to fully develop and mend well with each other, so it’s highly recommended that you don’t serve immediately. 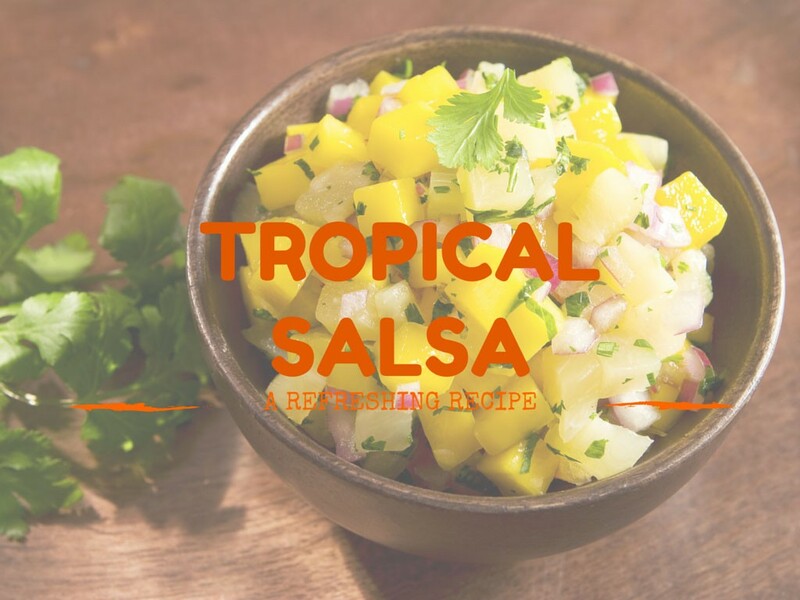 This tropical salsa is excellent with tortilla chips as an appetizer, but you can also use it to marinade chicken, serve it with tacos or burritos, or even as a dipping sauce for taquitos. Whatever you do, just make sure you mix up a large enough batch of this delicious salsa for everybody to enjoy, because it’s sure to go quickly! For more summery salsa recipes and fun dishes to try at home, follow the Macayo’s blog! Be sure to stop by your nearest Macayo’s to try our fresh dips and salsas, as well!